"The only one who can fight for these values like democracy and freedoms are the people of any country or any society, not the foreigners. Foreigners cannot bring freedom, cannot bring democracy, because this is related to the culture, to the different factors that affect or influence that society. You cannot bring it, you cannot import it. You cannot import anything from outside your country regarding the future of your country." "…we were on the way to democracy. We didn’t say that we are fully democratic, we were on the way, we were moving forward. Slowly or fast, that’s subjective, cannot be objective, that’s always subjective. But we’re moving forward in that regard, of course. But the criteria or the paradigm for us is not the West, not the Western paradigm, because the West has its own culture, we have our own culture, they have their own reality, we have our own reality. So, our democracy should reflect our culture and our habits and our customs and our reality at the same time." "We were on the way to democracy, it’s a process, it’s a long way. There’s no place you reach it, you say this is democracy. If you want to compare me to the West, to France, and other countries, no, you are much ahead of us, definitely, because of your history and because of many other circumstances and factors. If you want to compare me to your closest friend, Saudi Arabia, of course we are democratic. So, it depends on how you compare me." 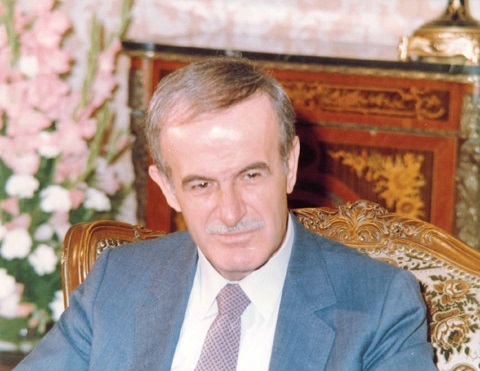 "Syria was at least on the way to democracy, at least we had a parliament for more than eight decades now. Women are in the parliament since that time, they have the right of election, again, since the beginning of the last century. You cannot compare Syria with Saudi Arabia. But we are on the way toward more democracy, and that’s a natural process. Democracy is not a prescription, it’s not only laws and decrees. Actually, it’s a long process. It’s a social and legislative process at the same time. So, we are moving in that way." "But the problem with the West is that they look at democracy as a goal. It’s not the goal; it’s the process. The goal is prosperity. Democracy is a tool to reach that prosperity, and we are using that tool and moving in that regard. So, it takes time, and that’s natural." "Now, in the crisis, the priority to the Syrian people is survival now, because it’s an existential threat to the Syrian people. When you talk about terrorism, it’s an existential threat. So, people first think about their safety and the safety of the country. How can you have democracy while you don’t have life first? You need life first, you need safety, you need security, then you can talk about democracy. You cannot reverse things." 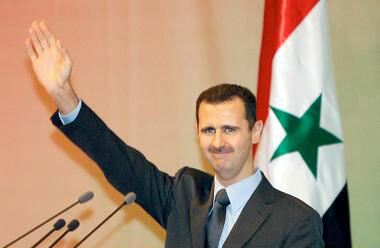 "As long as I have the public support of the Syrian people. That's my legitimacy; legitimacy comes from the inside, but why? I will tell you why. Because the West used to have puppets. Not independent leaders, or officials in any other country. And that the problem with Putin. They demonize Putin because he can say no, and he wants to be independent. Because the West, and especially the United States, don't accept partners. They only accept followers. Even Europe is not partner of the United States. That's to be very frank with you. So, this is their problem with Syria. They need somebody to keep saying yes. Yes-- a puppet. Marionette. And so on." "Honourable Syrians, Free Syrian Revolutionaries, three years and four months have passed since some declared, on your behalf: “The People want.” Yes, The People wanted…. The People decided…The People took action. A few years ago, some called for freedom – your response was to remain free in the age of subservience, to be masters in the age of slaves. They patronized you with their calls for democracy – your response was to show your will in the most democratic manner possible and refuse foreign intervention in your national affairs; you chose your constitution, you chose your parliament, you chose your president. Throughout, the decision was yours and your will has created our democracy." "They chanted: “The Syrian people are united”– your response was to face their storm of sedition, never allowing the winds of division to poison your hearts and minds; you were truly one people with one heart. They preached: “They bow only before Allah”–your response was to never bow before their masters, to never surrender, to never give up. You stood fast and held fast to your homeland, always believing in one God, a God who doesn’t share His powers with super-nations and who can never be substituted for oil or dollars. And when they said; “Allahu Akbar” – God was greater than them and their supporters, because God is always on the side of justice and justice is on the side of the people." "They will never find real answers because they depended on lackeys and agents. They did not know or understand how to deal with masters and honourable and patriotic people, and that is why they are more capable of understanding the terms of subservience, humiliation and dependence. They are unable to interpret the true meaning of honour, sovereignty and freedom. Those who want to predict the behavior and reaction of an ancient and civilized people should have the same historical and civilizational depth in order to fathom a great people’s strength and tenacity; this shows itself only in great national crises and at crucial historical junctures." "Of course, the solution cannot be anything but radical. There cannot be a partial solution. A partial solution is like no solution at all. This condition you are referring to, was a source of concern for us at the beginning of the crisis when we warned that what was happening had nothing to do with peaceful demonstrations, reform or democracy. Many people inside and outside Syria did not believe that. Now everybody, with no exception, is concerned, regardless of their political affiliation. Even those who provided an incubator to the terrorists and the armed groups, and before them to the anarchists and saboteurs, before terrorism took its stark shape, know this. Even these people have started to complain and look for a solution. Of course, better late than never; the solution, no matter how late, cannot be impossible, but it will be more difficult and more costly." From H.E. President Al-Assad’s interview with Tishreen Paper October 6,2013. "You cannot talk about reform and democracy while the ideologies are single-minded ideologies that don't accept any other one, because democracy, real democracy, is about accepting the others. Start by accepting the other, first of all, especially in a diverse society. So, I can say that we are still having the same will to move forward in that regard according to our reality. So, the scope of the reform will be limited by our reality." "such a creative interaction and national cohesion exists in the resistance Syria between our hero Army and dignified people as the essence of our success and title of our heroic steadfastness." From H.E. President Bashar Al-Assad’s Army Day Speech ,August 1,2013. "the Syrian martyrs, martyrs families, and the Syrians at large, who embody through their cohesiveness and integration with the Army a unique example for national unity, amity and fraternity." "This attempted erosion is targeting our national unity, our infrastructure, our economy and the services that the state has always provided. Those who are hostile to Syria would happily watch its destruction, even in the long run. 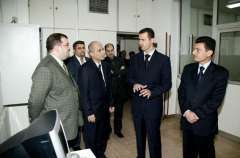 Another reason for western countries to support terrorism in Syria is their belief that these terrorist groups, which have been a security threat to them for decades, can be killed in Syria, hence shifting the battleground away from their own countries and destroying Syria in the process." From H.E. President Al-Assad's Interview with al-Thawra Newspaper, July 4,2013. "Beyond hypocrisy is when you talk about democracy and your closest allies are the worst autocratic regimes in the world that belong to the medieval centuries. This is hypocrisy!" "Our laws are tough and strict and whether they are right or wrong that is an issue for Syria,"
"The Damascus Spring is a pure media term with which the Syrian government does not deal. 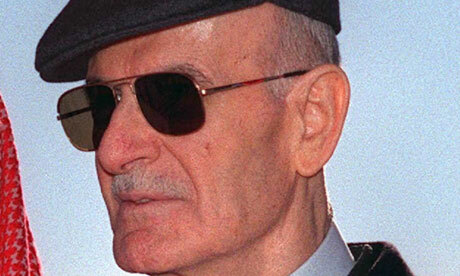 It only deals with reality,", "There are also other problems imposed on us from abroad, making us delay development projects and reverse priorities; mainly including Iraq war, Lebanon and terrorism,"
"Actually the democratic development has suffered from the serious setback recently especially after the war on Iraq. It's not only what you want to do. It's not only a matter of laws. You need the development of the society and you need the political atmosphere and you need the security. " "The democracy in your country and in Europe is a result of long history. It didn't happen suddenly. So you can't talk about abrupt changes in our region. It's a matter of time, and it should go this way, but not according to Western standards -- unless we change our customs and habits. So it's going to be democracy, but according to our standards." "Loyalty for the country is by not accepting foreign interferences from or by any embassy and I have always been clear on the subject or via any foreign government directly interfering with us,"
"Definitely, democracy is necessary for the entire world, but not in that context. If you want now to talk about the credibility of those who say such statements, let us take an example: If I look east I find Abu Ghreib, and if I look west I find Goantanamo. " "What is the relation between democracy and occupying a country like Iraq? What is the relation between democracy and having five to six million Palestinians outside their country? There are many things that harm the credibility of those people. Yes, we need democracy but our democracy. And if you say what is the meaning of our democracy you have to go back to culture. It should be step by step and should be internal by dialogue among the people of this country and society, and the Middle East at large. Any imported democracy, regardless the will behind it, is going to be a failure." "Is democracy more important than chaos? What is it based on? Is it based on better economy, on safety? What are the benefits of democracy if you don’t have the essential things in society? Democracy isn’t everything. It is a tool you use to have a better situation. You don’t use it to only say you are democratic. " "Elections are the end result of democracy. Democracy is how people think and accept each other. In mixed societies like ours you would have different democracies than what you have in your country." "We should also know a number of concepts. I use here what I said in my speech at the regional conference when we talked about national unity. How do we define national unity. We have examples in the region. There are nations that respect themselves which unite when they pass through a crisis, although they might have a thousand issues that they do not agree on. And there are nations in this region too which when they come under pressure and these pressures reach a crisis point they divide. Such nations do not respect themselves. One example, a person raises his voice in harmony with voices coming from outside his country and lowers it also in harmony with outside voices. This person belongs to the outside. How can he be a patriot and connected to the outside. Those who raise their voices should do that according to certain principles and according to national principles. Voices should be raised within the same house not in harmony with outside voices. I do not allow anyone to raise his voice from the outside and be called a patriot. We will deal firmly with unpatriotic cases, because these cause confusion at times of crises. " "In the final analysis we support having different opinions. Openness and all these issues are moving but slowly perhaps. I do not claim that we are moving fast and have never said that. Some people say that the process of development was fast and then slowed down. I say it was slow from the beginning. To be realistic, it has never been fast. But we have no other choice but to move forward using our capabilities in order to enhance national unity. We do not differ from other societies. Patriotism or the lack of it exist everywhere. At times of crisis we have to control these cases with the objective of consolidating national unity as I said. " "I would like to touch on a subject which has been raised in the media, which is the party law. Discussions of this law have started, but they will take a long time because of the sensitivity of this issue. Another issue is that of the census, because it was discussed during the regional conference. This issue was in fact settled in 2002, when I visited the city of Hasaka and met community leaders. The issue of the census was raised, and I said at the time that no one in Syria is opposed to solving this problem. It is a technical issue, and we started solving it in 2002 by studying the criteria put for solving the problem, i.e. granting the nationality. In the last stages there have been some details which were not finalized, until the events of March 2004 happened, and we thought there was a big problem. We discovered later that it was a passing ordinary problem. Political developments delayed this issue. Now there are authorities in the state which are putting the final touches and we will solve this issue soon in an expression of the importance of national unity in Syria. " "We have to know that whatever we do, or try to achieve, needs a national and moral base to build our reform project on. If this country belongs to all its faithful sons and daughters, it could not belong to those who have rancor against it or those who play with its capabilities, those who see the national interest only through their own narrow interest and only remember the rights they are entitled to enjoy and forget their duties. We always talk about national unity, but we hear expressions like a conference for national reconciliation, as if we were feuding tribes in this country going out of a civil war. When we speak about consolidating national unity, it does not mean that this unity does not exist, because this means civil war. There are no half-solutions, but the national unity, like everything else, has standards and criteria, not necessarily in terms of numbers, but it depends on the national situation and it depends on every citizen. Since we are at the university, when two students pass, the first gets 48+2 and the second gets 90, the first student is not like the second. Both of them pass but there is a difference. When two students pass the secondary school certificate, a student gets 110 grades and the second gets 260, there is a difference. When we talk about enhancing national unity, we mean upgrading this unity so that it becomes a general and strong condition throughout the country. There is sometimes confusion between chronic cases and acute cases (doctors understand this here). Treatment of chronic cases is different from treatment of acute cases. Now we have a crisis, or a problem, or a difficult situation. Let us do this in order to overcome the crisis. I say this is wrong. If we arrive at a crisis and we have not done anything to overcome it before, then it is too late. Everything we do is for the future. These are remedies for future cases. As I said earlier, crises will never stop, because there is a plan moving in a certain direction against Syria and against the whole region. What we are doing now is preparing for future crises. We do not have to stick to a straw. We have to do things about whose results we are certain and use the capabilities that we possess today. This must be clear. Of course when such things are suggested, they are suggested in good faith because when we do something we need to know when to reap the results. " "I hope we can make better steps toward democracy in our country, but that takes time. But no one in Syria, or may be in the region if I want to exaggerate a little bit, asks for help from any country to have his own democracy." "I think before the war on Iraq some thought about this, but after the war they changed their minds. Only a little percentage of people used to think before the war that the war on Iraq would help democracy in the region. Most of them now think this is a bad example of bringing democracy. " "Freedom and democracy are nothing but instruments, just like stability. The goal is called progress and growth. Anyone who puts freedom ahead of stability is hurting growth. Besides, Abu Ghraib, Guantanamo and Iraq aren't exactly models of freedom." "The more meddling there is, the slower the pace of development in Syria. After all, the democratic process should pervade the entire country. Naturally, the unresolved Middle East conflict also slows down development. And then there is the question of what should be our greatest priority -- political development or economic growth." "The result of the referendum is an expression of the will of the people and there is nothing I can do except to respond to the will of the people and to willingly accept to carry the mission I am asked to carry and shoulder the burdens and tasks related to fulfilling my duty during these very delicate and sensitive circumstances which our country, our nation and the world at large are going through at the moment. I shall try my very best to lead our country towards a future that fulfils the hopes and legitimate ambitions of our people."